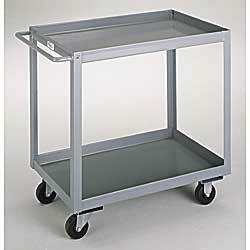 Multi-purpose cart is popular in the warehouse, factory, or shop. Trays include 2"D formed edges that are double-welded for added strength and rigidity. 3/16" x 1-1/2" x 1-1/2" supports. 3/4" formed round milled steel handle. Two rigid and two swivel casters are mounted to cross channel bolsters for added support. SELECTED MODELS IN STOCK. Other FACTORY QUICK SHIPFOB NEBRASKA. XA-2271 4" Rubber	 60	 2	 23"	 28" x 16"	 33"
XA-2272 4" Rubber	 77	 2	 23"	 32" x 20"	 33"
XA-2273 4" Steel	 60	 2	 23"	 28" x 16"	 33"
XA-2274 4" Steel	 77	 2	 23"	 32" x 20"	 33"